How do I fix an exterior door knob that will unlock but not turn? I'm more inclined to go with the latter than the former. Any other suggestions? In its currently disassembled state, there is nothing locking the mechanism. You are correct that the C shaped half-circle shaft is what pulls the latch back when turned. If you cannot push the latch back with your finger, the anti-jimmy device has had a piece break in it. 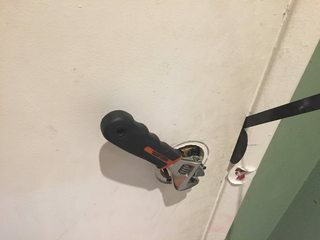 I had this happen on a bathroom door latch about two weeks ago, probably made by the same manufacturer as the shape of the lock actuator rod and latch actuator are exactly the same. If you look at it, the lock actuator rod (the center piece you were turning) has a taper section just where it passes through the latch pull which means that during assembly, you manually push the latch back and it passes straight through. In order to get clearance so the lock actuator rod will pass through, I pried the folded piece that they pass through till I got clearance so the shafts would pull out. I then squeezed the folded piece back together and pushed the latch out. It didn't even require taking the door off the hinges. Replace the whole door knob/latch assembly with new and you're back in action. I would remove both the inside and outside doorknobs. 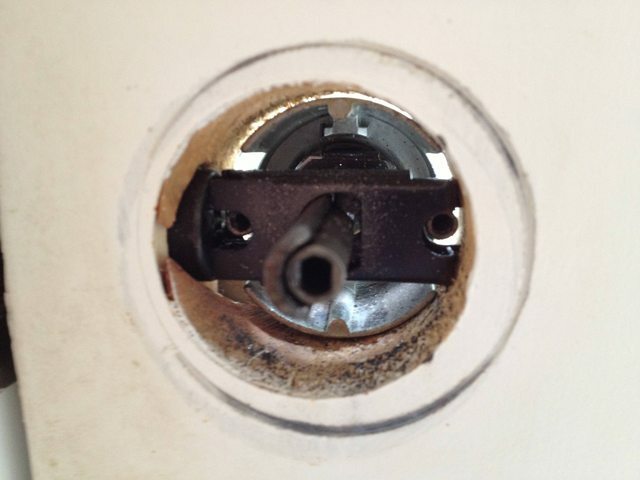 Use a screwdriver to turn the bolt mechanism (the part that actually locks the door. Try to insert a small screwdriver between the door and the jamb and push the bolt back while turning the mechanism in the door. 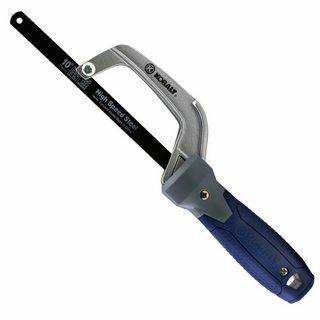 It may help to push or pull on the door on the door at the same time. If none of this helps try to tap the pins out of the hinges. Use a screwdriver and a hammer. Beaware that some hinges use setscrews to hold the pins in place and the door has to be open to gain access to the setscrews. Once I cut through the latch, the door could be opened and the latch replaced. However, I did notice that the door hinges needed tightening so that it swings closed all the way. I also adjusted the strike plate, which wasn't properly holding back the deadlatch. 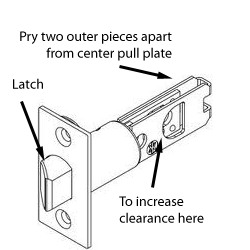 I believe if I'd failed to do those things, the new latch would have had the same problem as the old one. Be sure to test the new lock carefully to make sure it's secure. Not the answer you're looking for? Browse other questions tagged doors lock or ask your own question. How to unlock a locked interior door?